My current setup with a PS3 connected to HDTV along with a one TB WD MyBook 1110 full with movies photos and TV serials connected to TV via USB and my XPS 1210 running windows 7 media server. 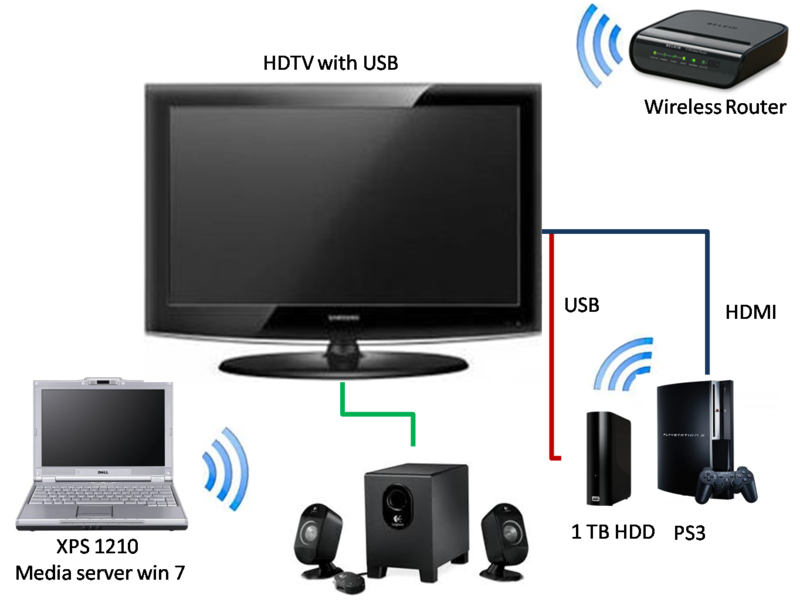 The laptop and PS3 are connected through a wireless network and PS3 is connected to TV via HDMI. This is my latest media setup which allows me to play games as well as movies, music and photos stored on my laptop without copying to PS3. The wireless network is secure (WEP + MAC restricted). I choose which devices can connect to my wifi network. My TV is Samsung series 4 (nothing too fancy) HDTV and can run the content on the 1 TB HDD via USB. This doesn’t need the PS3 to be switched on. 1. I hate to keep copying content from one device to another. 2. It keeps it hassle free. 3. As all my devices are mostly on I don’t have any issue. 4. I can play, watch movies and listen to music from the comfort of my bed. 5. The speakers are awesome. I can control the volume via the TV. Nvidia launched its GeForce GTX 560 Ti graphics card recently but for people who don’t have $250 or so to buy a new graphics card, Nvidia has a new product that might be more to your liking. The company announced today that it has launched its GeForce GTX 560 card which is priced at about $199. The card is available for sale now via a number of different third party graphics card makers. Nvidia says the GeForce GTX 560 will be able to handle things like PhysX-based game physics effects, 1080p resolutions and Nvidia’s 3D Vision all with the lower price point. To prove it, it released a video showing off the GTX 560 running three games. One is the previously released fantasy MMO game Rift, but the other two games are the currently unreleased Duke Nukem Forever and Alice Madness Returns. The video shows off part of the beginning of Duke Nukem Forever running on the PC which will be the only version of the game that will support 3D via Nvidia’s 3D Vision glasses and supported monitors. In the Alice: Madness Returns sequence the video shows how the game benefits from Nvidia’s PhysX game support with a number of graphical and physics effects that are not present when PhysX support is turned off. In addition to the new graphics card Nvidia has also released new beta drivers for all of its GeForce graphics cards. The R275 beta drivers boosts performances in a number of games including recent titles like Crysis 2, Bulletstorm and Portal 2. It also adds 3D Vision support for a number of current and upcoming games like Duke Nukem Forever, Age of Empires Online, Dungeon Siege III, Portal 2 and more.